Charlotte Crow and Sheila Corr, deputy and picture editors at History Today, give their first impressions of Tate Britain's latest exhibition. Is there such thing as a British sense of humour? The TV show Britain’s Got Talent has addressed that question in more ways than one. If you have giggled at the contradiction between that programme’s title and anything you might have seen of its content, you will be both amused and impressed by 'Rude Britannia'. Tate Britain’s dynamic celebration of British comic art spans the 17th-century to the present and explores the serious interface between humour and issues of identity (and much else besides) with a fitting lightness of touch. An inspired move is the involvement of guest curators Gerald Scarfe, Harry Hill, Steve Bell and Viz Magazine who bring celebrity to proceedings (in a good way), as well as their own distinct artistic contributions. For example, in a room devoted to social satire, dominated by an enormous three-dimensional Viz Magazine, that comic’s love-to-hate character Roger Mellie ‘The Man on the Telly’ appears in a parallel storyboard offering facetious commentary to each scene in Hogarth’s Rake’s Progress. 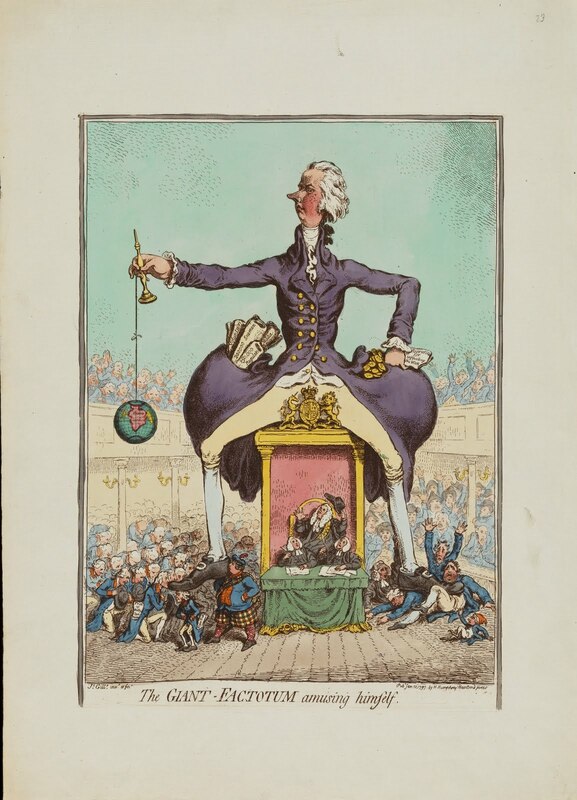 To enter a Sitting Room, where visitors can sit comfortably to peruse cartoon and comic books at close quarters, you must go through the bandy legs of a giant William Pitt, Gerald Scarfe’s take on James Gillray’s The Giant Factotum Amusing Himself (1797). What this exhibition achieves most successfully, in galleries which explore themes ranging from politics, to social satire, the grotesque, the bawdy and the absurd, is the juxtaposition of historic works with contemporary material so that both can be viewed in fresh ways. Hopefully this imaginative presentation will awaken a new generation to the roots of one of Britain’s genuine talents: the art of irreverence. Vibrant, witty, colourful and often, as it claims, extraordinarily rude, this exhibition celebrates the role of humour in British visual culture from the 17th century to the present day. What a joy to see a major gallery devote space to this subject which allows for the use of plenty of three-dimensional objects and other large pieces such as Cruikshank’s Worship of Bacchus. Tate curators have been ably assisted by guest contributors who offer their own unique insights into the exhibits. 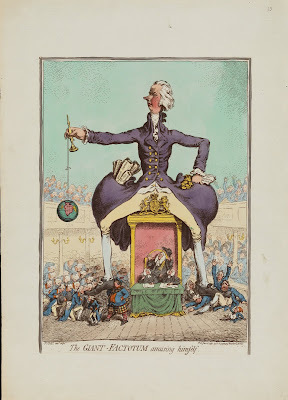 While this is undoubtedly a refreshing view, explanatory captions could provide some helpful historical background, especially in the 'Politics' section where a person’s ‘tab of identity’ (as Low apparently called it) has to carry the whole story behind some of Gillray’s most vitriolic outbursts. Most of the historical threads are familiar to me, from broadsides of Cromwell through the work of Hogarth and Patch, and the technological advances in printing which took caricature from the popular Macaronis to the mass market in Punch and comic publications of today. But I was also delighted to discover unknown work such as John Collier’s painting The Hypocrite and the mid-19th-century publication The Penny Satirist. Self evidently though, the loud and vulgar will draw in the greatest crowds and, while surprised yet again with the explicit nature of the earliest examples in 'The Bawdy' section, I was most amused by the time-warp caption labels for McGill’s saucy seaside postcards of the 1950s stating ‘Original postcard attached to Director of Public Prosecution’s index card’.